Even if an opportunity sounds promising, sometimes turning it down could be the best business decision you make. If you are fortunate enough to be successful as an entrepreneur, people and companies will want to do business with you. That can be a good thing. It can also lead you down a path that could bring your company to its knees. 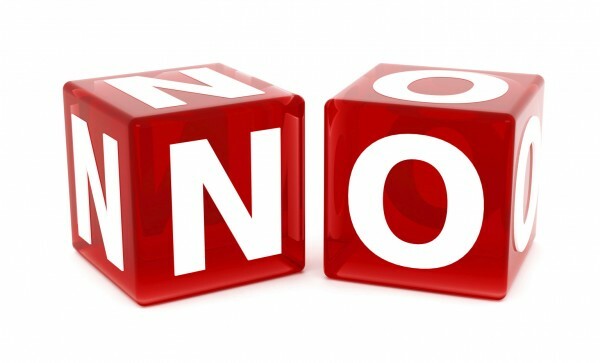 There are times in your business life when saying “no” to an opportunity is the best decision. Unfortunately, improper planning, poor focus, and the fear of losing out on a potential windfall can override your initial decision and that’s when you get into trouble. If the foundation for your own company isn’t solid, why in the world would you take on one more opportunity? 1. The opportunity doesn’t get you closer to your goals. I’m a big proponent of having a plan with specific, measurable goals. A good plan can help you separate opportunities from wild goose chases. When someone comes to you with a “can’t miss” idea, stress test it against your plan. The opportunity may get your partner closer to his or her goal, but will it help you get closer to your goal. Remember, potential partners will have different agendas. 2. Your own house isn’t in order. This is the easiest reason for you to say no to someone. If the foundation for your own company isn’t solid, why in the world would you take on one more opportunity? All you’re doing is speeding up the eventual collapse of your business. For example, say you launched a women’s clothing company a year ago. The business is going OK, but you have issues with manufacturers, distribution, and some of your customers are slow in paying you. You attend an expo and meet another business owner who produces jewelry and handbags for women. They suggest you take on their line as it would be a perfect complement to your clothing line. If, after an honest assessment, you believe that you’re not ready to take on a new challenge, simply say no. Focus your efforts on getting your foundation set before you start adding to it. 3. The opportunity siphons off valuable resources from your own projects or programs. As a business owner, you understand the term “finite resources” better than most people. You have a finite amount of money, time, and human capital to help you achieve your goals and take your company to the next level. If you give a new opportunity access to these resources, can you still achieve your original goals? 4. You have the wrong partner. Partnerships are never 50/50. Invariably, one partner gets stuck doing the majority of the work without receiving the same percentage in compensation. Another obstacle is when you realize that the partner you chose (or the partner who chose you), doesn’t have the requirements or resources to live up to their end of the agreement. For example, say you want to host a series of events to promote your products and services to your target audience. However, you realize that the cost and effort to host the events on your own may be too much for you to handle. You decide to bring in a partner with a complementary product or service. They promise to promote the event to their customers and will provide onsite help, as well as share in the cost of the event. As you get closer to the actual event, you realize that your “complementary” partner really oversold their ability to register their customers for the event and he or she doesn’t have as many resources to dedicate to help you make it a success. Before you sign on the dotted line, make sure that expectations are clearly understood and you’ve done your homework on determining whether or not you have the right dance partner. Some partnerships are like marriages. Make sure yours doesn’t end in a messy divorce. 1. Be selective. When in doubt, say no! 2. Don’t over-commit your resources. 3. Only put in what you can afford to lose. 4. Have a “go/no go” point. Pick a date between the time you first heard about the opportunity and when you need to commit finances, resources or sign an agreement. If you don’t have sufficient answers to your questions about the opportunity or if you’re not sure it will be successful, say no to it. 5. If you do commit, be in it to win it.